Home » tooth » Ear Pain Due to Tooth... In the Ear Canal! Ear Pain Due to Tooth... In the Ear Canal! The Daily Mail published a story about a patient who suffered from right ear pain since the age of 14 that ultimately was found to be due to a tooth in the ear at the age of 47 years! Removal of the tooth resolved his long-standing ear pain. 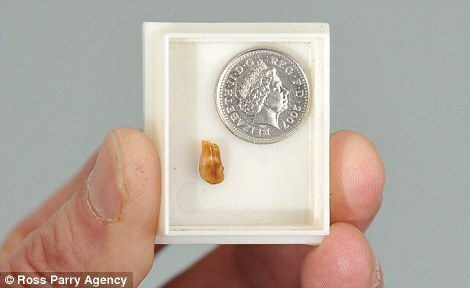 It was also the last tooth to get removed as he had all his teeth inside his mouth removed years ago. Based on the size, it is conjectured to be a baby mandibular front incisor. My theory? Either he or some other kid put the tooth there and than forgot about it... It happens! Read this interesting story here. Read about other causes of ear pain here.